We’d love your help. Let us know what’s wrong with this preview of Fever Dream by Samanta Schweblin. To ask other readers questions about Fever Dream, please sign up. this book was, for me, impossible to understand...it's just like a nightmare that you try to make sense of, but can't....I would say don't bother. I would love to hear someone's take on it? Are there any book club questions available? This answer contains spoilers… (view spoiler)[ What is "David" trying to get Amanda to recognize/know? What does Amanda actually want to know? Given the book's title, how much should the reader…more What is "David" trying to get Amanda to recognize/know? What does Amanda actually want to know? Given the book's title, how much should the reader assume is "real" and how much is dream-logic/hallucination? I finished the story last night and I'm still magnificently unsettled. As I read I was gripped by a suffocating sense of dread that never let up. The story is told in dialog, and neither of the participants in the conversation are fully connected with a rational world of cause-and-effect. Nothing is ever completely explained. The novel asks you to banish any thoughts like "what is going on?" from your mind as you read, and to yield to its unhinged and unexplained storytelling style. As in a real I finished the story last night and I'm still magnificently unsettled. As I read I was gripped by a suffocating sense of dread that never let up. The story is told in dialog, and neither of the participants in the conversation are fully connected with a rational world of cause-and-effect. Nothing is ever completely explained. The novel asks you to banish any thoughts like "what is going on?" from your mind as you read, and to yield to its unhinged and unexplained storytelling style. As in a real fever dream--as in a nightmare--the events in the novel move in shuddering and unpredictable ways, from the mundane to the terrifying and back again. Always though events are closely anchored to one or another universally human fear: the fear of paralysis; the fear of abandonment; the fear of dying; the fear that one's children are in danger; the fear of being trapped. "The genius of “Fever Dream” is less in what it says than in how Schweblin says it, with a design at once so enigmatic and so disciplined that the book feels as if it belongs to a new literary genre altogether." Unlike the reviewer though I recognized strong similarities between Schweblin's work here and contemporary authors Jeff VanderMeer (Annihilation) and Amelia Gray(Threats; Gutshot). 3.5 Strange, so very, very strange, but intriguing and unique. The title, Fever Dream, and indeed this reads like a disturbing dream. A young woman and mother is dying in hospital, a young boy David at her side, not her son but he wants her to remember how she got there and where her young daughter is, what append to her? First translated novel from this Argentinean author, it is a novel of sparse prose, but unrelenting tension. David tries to keep Amanda on point, to remember only what is import 3.5 Strange, so very, very strange, but intriguing and unique. The title, Fever Dream, and indeed this reads like a disturbing dream. A young woman and mother is dying in hospital, a young boy David at her side, not her son but he wants her to remember how she got there and where her young daughter is, what append to her? First translated novel from this Argentinean author, it is a novel of sparse prose, but unrelenting tension. David tries to keep Amanda on point, to remember only what is important but even dying she needs to understand things her way, go over it all, despite her safety distance with her daughter, this still happened. Like a dream it often seems unreal but the message the novel conveys is very real, a warning of things, dangers that cannot be taken back, the very real harm they cause. WHoa. This was trippy. And I loved it. 1/6 from Booker International Prize Shortlist. Engrossing, Weird, Well written and amazingly structured, Dark, Confusing, Upsetting, Hallucinating, Intoxicating, Crazy, Surreal, Captivating, did I say Weird? I followed my friends’ recommendation to read this short novel in one sitting and I can confirm it is the best way to go through it. It is an essential requisite to enjoy the novel, to enter and remain in the intoxicating atmosphere the author weaves around the reader. The spell would have be 1/6 from Booker International Prize Shortlist. I followed my friends’ recommendation to read this short novel in one sitting and I can confirm it is the best way to go through it. It is an essential requisite to enjoy the novel, to enter and remain in the intoxicating atmosphere the author weaves around the reader. The spell would have been destroyed if I had approached it any other way. I needed 2 uninterrupted hours to read this and I though a plane trip to Rome to be the perfect opportunities. The bonus was a turbulent flight which elevated the scary feeling of the book to new heights, so to say. I was complaining in one of my last reviews that dull books are the hardest to review. That was before Fever Dream. How do I review a book that it is still a mystery for me, one week after I finished it. I find it very difficult to make sense of this freighting and crazy ride that Schweblin took me for. This is how the novel starts. These are one of the strangest opening lines that I’ve ever read. Amanda is lying on a bed, waiting to die and next to her is a child, David. The novel is structured as a dialogue between the two of them, set in the present about Amanda’s recollection of events carried out a few days before. Those events are set during a vacation she takes with her daughter, Nina, to the country side and involves her neighbor Carla and his son, David, the one that is coordinating the interview from the Amanda’s bedside. The more we advance in the story, it becomes increasingly frightening and surreal. I was feverishly turning the virtual pages to find an explanation/resolution to what was happening, to understand who the worms were. The ending left me more puzzled than the beginning but the suffocating and intense journey was worth it. 3rd theme is what gives the novel the surreal, horror like atmosphere. It deals with the transmigration of the soul and you will have to read the novel to see what this is all about. That was weirdly fascinating. Absolutely worth a read. But confusing, very much so. But in a good way. My thoughts are all over the place for this one. While I really enjoyed reading this book, it still left me feeling fairly confused during and afterwards. Usually I try to write my reviews as quickly as possible after finishing a book but this time I couldn't have done that because I seriously needed some time to gather my thoughts. This is one of those books that isn't really "about" anything. I That was weirdly fascinating. Absolutely worth a read. But confusing, very much so. But in a good way. This is one of those books that isn't really "about" anything. I mean, yes, on the surface it is about a woman in a hospital talking to a boy that isn't hers about what has happened to her and her daughter. But that isn't really it, this is just the first layer of meaning you can unpack from this short but impactful book. It is about a mother's fear, about voodoo, about trust, about losing everything, about fever dreams, and other dreams, about nothing at all. The book is structured as a dialogue between Amanda and the boy and as such it is wonderfully circular and weird and just like a conversation one might have (minus the worms). This is a book that practically begs a reread, there is so much to unpack, so much to understand and this understanding didn't happen for me the first time around. I mean this in the best way possible. I love how highly metaphorical this weird little book is and I think there just is something really special about the whole experience. I definitely understand why it is longlisted for the Man Booker International and I am excited to see more people reading this as a result. It is absolutely worth it - if you're okay with weirdness and thing being just beyond the grasp of reason. I received an arc of this book curtesy of NetGalley and Oneworld Publications in exchange for an honest review. Thanks for that! I couldn't put this down. It's a quick read anyway, but still the story draws you in from the first page. There's so much going on, and Schweblin's delivery is perfectly paced as the plot develops. There is an eerie, something's-not-quite-right tone which presides over the story, and subtle reminders of this pop up every once in a while. I feel that the ending was a little rushed; in a way it finishes the story, but also leaves the reader with a lot of questions. Do you ever read two (or more) completely unrelated books, in quick succession, that seem – somehow, by coincidence – spiritually identical? This has happened to me recently with Iain Reid's I’m Thinking of Ending Things and Samanta Schweblin's Fever Dream. (I'm tempted to add Jen George's short story collection The Babysitter at Rest too, since it's insistently dreamlike and illogical, but it's too irreverent to be a true match for the others.) Both Ending Things and Fever Dream are very sh Do you ever read two (or more) completely unrelated books, in quick succession, that seem – somehow, by coincidence – spiritually identical? This has happened to me recently with Iain Reid's I’m Thinking of Ending Things and Samanta Schweblin's Fever Dream. (I'm tempted to add Jen George's short story collection The Babysitter at Rest too, since it's insistently dreamlike and illogical, but it's too irreverent to be a true match for the others.) Both Ending Things and Fever Dream are very short novellas that can easily be read in their entirety in an hour or two. They share a sense of shifting nightmare logic and a horrible compulsive darkness that makes you burn through the pages in search of an answer. Both feel predominantly like horror stories despite the absence of many of the genre's typical hallmarks and the fact that they are not packaged as horror. Fever Dream opens with a disorientating conversation; I had to read the first page several times. Eventually it becomes apparent that the narrator, Amanda, is lying in a hospital bed and answering the questions put to her, with some urgency, by a boy named David. She is telling a story, or rather recounting things that have happened to her, while David is trying to identify 'the important thing', 'the exact moment when the worms come into being'. What worms? Well, exactly. It doesn't seem likely they are actual worms, but in this aptly-named novella you can never be sure. A narrative emerges, taking place just a few days earlier. Amanda and her young daughter, Nina, meet David and his mother, Carla, while on holiday. Carla claims there is something wrong with David, and then she, in turn, tells Amanda a story. When David was three, he was poisoned after drinking contaminated water from a stream. Carla took him to 'the green house', where a local woman performed a 'migration': sending David's soul into another's body so he could continue to live. Since then, his body has been inhabited by the spirit of another. So Carla says. What happens to Amanda and Nina after this is what leads to Amanda's hospitalisation and David's demand that they pinpoint 'the exact moment', 'before time runs out'. Though some aspects of the story seem meaningful to Amanda, David dispassionately skips over anything he deems unimportant. Some details are recurring motifs: Carla's gold bikini, Nina's cuddly toy mole. Then there's the matter of the 'rescue distance', Amanda's obsessive idea of how far she can safely be from her daughter in case of an emergency. It's quite a strange thing to read a story where you fear the ending but feel a desperate need to get to it. Fever Dream made me feel sick, but I can't tell you why. It really is like a nonsensical dream from which you wake with a great sense of dread, as though you've had a terrible nightmare, even though the details weren't particularly horrifying in themselves. I'm really not sure I understood it, and reading other reviews, including those from professional critics, I'm not convinced many other people did either. It teases some dreadful shock but never shows its hand. In the end, that lack of an answer, the fruitless search for understanding, is the real horror. I received an advance review copy of Fever Dream from the publisher through NetGalley. Hmmm, how to review Fever Dream? I don't think I've ever read anything like it before. It has the most incredible sense of unease running through its twisting narrative. I had no idea what was going on for most of the novel and I'm still not entirely sure I do. But it's not a story I will forget in a hurry. Amanda, a holidaymaker in rural Argentina, lies in a hospital bed. David, the creepy son of a local woman named Carla, sits nearby and presses Amanda to recount the events that have led her he Hmmm, how to review Fever Dream? I don't think I've ever read anything like it before. It has the most incredible sense of unease running through its twisting narrative. I had no idea what was going on for most of the novel and I'm still not entirely sure I do. But it's not a story I will forget in a hurry. Amanda, a holidaymaker in rural Argentina, lies in a hospital bed. David, the creepy son of a local woman named Carla, sits nearby and presses Amanda to recount the events that have led her here. She can't see or move. David says it's because of the worms and that "we have to find the exact moment when the worms come into being . . . It’s very important, it’s very important for us all." Amanda tells him about the recent conversations she has had with his mother, which reveal a distressing tale. She knows she is about to die in this dark hospital room. But what are these worms David keeps talking about? What is the "important thing" he constantly refers to? And what on earth has become of her young daughter Nina? Maternal anxiety is one of the main themes of Fever Dream. Amanda talks about "the rescue distance" throughout the story, a continuous mental calculation she makes of how long it would take to rescue Nina in an emergency. Carla initially felt the same concern for David's well-being but ever since the terrifying incident that occurred, she feels like she has lost him. He seems like a different person, she says. Amanda is eternally conscious of Nina's safety but it only takes one horrifying, seemingly innocuous moment for her world to unravel. "Distancia de rescate" es una novela inquietante que te aplastará en el sillón del que no podrás levantarte hasta terminar de leer. No te preocupes, es cortita. Una narración sobre una obsesión y una culpa en un contexto de desastre ecológico. El cuidado, la vigilancia del hijo, su seguridad, se transforma en una obsesión malsana para una madre que asiste al relato ponzoñoso, lleno de remordimientos y atávicas supersticiones de otra madre que por una vez no respetó la justa (?) distancia de resc "Distancia de rescate" es una novela inquietante que te aplastará en el sillón del que no podrás levantarte hasta terminar de leer. No te preocupes, es cortita. Una narración sobre una obsesión y una culpa en un contexto de desastre ecológico. El cuidado, la vigilancia del hijo, su seguridad, se transforma en una obsesión malsana para una madre que asiste al relato ponzoñoso, lleno de remordimientos y atávicas supersticiones de otra madre que por una vez no respetó la justa (?) distancia de rescate (esa distancia máxima con el hijo que nos permitirá salvaguardarlo de todo peligro). Baste con estas notas. El lector debe tener el placer de ir descubriendo las claves de la narración, de ir acostumbrando la vista a la espesa niebla que empieza cubriéndolo todo y que nos confunde haciéndonos ver monstruos y peligros allá donde fijemos la mirada. Debemos seguir el ritmo que tan hábilmente nos va marcando Schweblin. Ella nos acompañará, no siempre corta la distancia de rescate, conduciéndonos sin apenas indicaciones, aunque todas relevantes, nada es superfluo, hacia el destino que nos tiene reservado sin que sepamos con certeza si el camino que recorremos es de terror, fantástico, onírico o es otra cosa o todas juntas. Un relato que nos llega únicamente a través de una de las madres y a instancias de una voz que apremia a contar. La autora sabe como contagiarnos la prisa, la impaciencia de esa voz por saber, y que en nosotros toma la forma de necesidad por hacer pie, por abandonar el terreno fangoso, nada firme, por el que nos lleva (y ojalá no descubráis muy pronto las claves de un relato quizás demasiado supeditado a las inseguridades del lector). Y junto a esa impaciencia, Schweblin consigue magníficamente provocarnos el desasosiego ante una catástrofe que advertimos inminente, ante un peligro que no sabemos muy bien por donde aparecerá y en qué consistirá. Updated 4/21/17: Congrats to Ms. Schweblin on Fever Dream being shortlisted yesterday, 4/20/17, for the 2017 Man Booker International Prize. Nearly 3 months out from reading this brief novel, and I remain haunted every so often by visions of a horse's head and of squirming worms. Perhaps the ominous chevaline cloud over the novel, with certain players exposed to some undescribed toxin (maybe via the grass), is meant to represent the drug heroin given that the terms "horse" and the Spanish"caballo" are two of this deadly drug's most common street names. Don't misunderstand me. Even if my attempt at a little decryption is correct, it does not make a wit of difference to my comprehension of what transpired. Though I can't help but feel that flying through this short novel was perhaps like "chasing the dragon," so to speak. I was thoroughly consumed with this especially quick read from start to finish. In her highly original debut, Ms. Schweblin, Buenos Aires-born, Berlin-based author, is most impressive in her setting a miasmal mood, with a sometimes-fragmented conversation between a mother and a neighbor's son under the exigency of apparently imminent death, and in her masterly pacing by infusing the book with a thrumming current of mysterious dread (including, e.g., chimeric worms) and a drumming from around midpoint that rapidly progresses to a furious pace. I'd say reading this is a worthy experience, particularly if you enjoy chasing dragons or you can pick up a copy at the local library. This little book is like a shotglass full of crazy. Bottoms up and brace for the effect. Amanda and her young daughter, Nina, are renting a cottage near a horse ranch. It's a very different place from their usual summer retreats. Both of them linger by the pool. The warm sun and the soft breeze lull them into a blissful state. But the presence of another female, Carla, causes them to turn their heads in her direction. She is barefoot and wearing a shiny gold bikini. Carla opens the car door and slides behind the wheel. Amanda and Nina find themselves inside the vehicle, too, as Carla begins to tell them a very complex and unsettling story about her son, David. 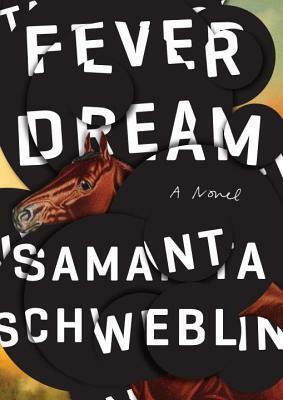 Fever Dream is the first novel of Samanta Schweblin and a finalist for the Maio Vargas Llosa Prize and winner of the Tigre Juan Prize. It's been translated by Megan McDowell. Schweblin is originally from Buenos Aires. But it is the Buenos Aires connection that intrigues me. Perhaps the tale within is a composite of regional folklore twisted and diced with haunting recollections of things "that go bump in the Buenos Aires night". There's also the flavor of sights and sounds that hold no particular meaning except that these elements give off a whiff of crawling decay that sticks to your fingertips. Freaky. As. Hell. At only 150-some large-print pages, this should probably be read in one sitting for maximum effect, the spell shouldn't be broken (I read nearly all of it last night and finished it just now). The momentum just keeps carrying you forward, making it hard to stop even if you wanted. Brilliant. Full review to come. A woman named Amanda lies feverish and dying in a hospital bed, and she has no idea how she got there. A young boy is her only companion, whispering in her ear, guiding her to some important moment that she needs to remember. Something to do with worms. Getting inside her. She tells him the story of the past few days, reliving the seconds as if they were happening in the present. She recounts vacationing with her young daughter in a small town, where she (Amanda) becomes friends with a woman next door who has a frightening story about how her little boy is not really her little boy: he looks just like her son, but he's something else entirely. Wondering how all this leads to Amanda's current dying state is what keeps the reader turning the pages. Not only that, but there's an underlying creepiness throughout, embedded within the pages. There were several times when I was majorly freaked-out even when nothing scary was happening on the surface. There's just an eeriness to the prose itself that slowly grows and grows, which separates this from a typical well-told horror story, and trying to figure out just what the hell was going on made me stay up til 5:30 in the morning to try and finish it (alas, I had to finish the last few pages a few hours later when I woke up, which thankfully didn't ruin the effect). Highly recommended for fans of literary horror, or for anyone in the mood for a perfectly-paced mystery with ambiguous supernatural goings-on. للوهلة الأولى الرواية مرعبة، غريبة وحابسة للأنفاس، لكنك لن تستطيع إفلاتها من بين يديك حتى الصفحة الأخيرة. وبعد الانتهاء منها لن تنتهي هي منك. انهيت قراءة الرواية الساعة الواحدة بعد منتصف الليل، ولم أتمكن من النوم بعدها، وأنا أفكر في هذا الكابوس المرعب، وكيف أنه حقيقي ويحدث كل يوم في عدة أماكن من هذا العالم. آماندا، أم شابة، تحتضر في المستشفى، وإلى جانبها يجلس "دافيد" طفل امرأة أخرى، يحاورها ويحاول معرفة ما الذي أوصلها إلى هنا بينما تحدثه عن ما حدث لها هي وطفلتها "نينا". يحاول للوهلة الأولى الرواية مرعبة، غريبة وحابسة للأنفاس، لكنك لن تستطيع إفلاتها من بين يديك حتى الصفحة الأخيرة. وبعد الانتهاء منها لن تنتهي هي منك. آماندا، أم شابة، تحتضر في المستشفى، وإلى جانبها يجلس "دافيد" طفل امرأة أخرى، يحاورها ويحاول معرفة ما الذي أوصلها إلى هنا بينما تحدثه عن ما حدث لها هي وطفلتها "نينا". يحاول الوصول إلى إجابة تُهِمّه بينما تحاول آماندا عبر التذكر الوصول إلى إجابتها الخاصة. تراقب بقلق مسافة الإنقاذ بينها وبين طفلتها "نينا"
"تكمن النقطة الأساسية في تفصيل ما، لا بد لأحدنا أن يكون ملاحظاً"
تمسك الرواية بمخاوفنا: الخوف من فقدان البيت، الخوف من الفقر، الخوف من الموت، ولذلك نحاول البحث عن طرق النجاة حتى لو كانت نتيجتها أن نتحول لأشخاص آخرين، روح جديدة في الجسد القديم. الخوف على الأطفال، حالة القلق الدائمة، مع كل حركة وخطوة يخطوها الطفل. والحساب العبثي لمسافة الإنقاذ اللازمة للقيام بما يلزم. "يظلّ الابن، يا كارلا، ابناً مدى الحياة"
يجب أن تكون متيقظاً على الدوام، لا يمكنك السهو ولو للحظة واحدة. لحظة واحدة يمكن أن تغيير كل شيء، لحظة واحدة يمكن أن تقلب العالم رأساً على عقب. يمكن لهذا أن يعبر عن كل شيء في حياتنا، ليس أطفالنا فحسب، بل كل ما يحدث في حياتنا. لحظة واحدة كافية لخسارة كل شيء. "المسألة هي أن العيون كلها لا تكون كافبة في بعض الأحيان، يا آماندا. لا أدري كيف لم أرَه؟ وبسبب أي براز كنت مهتمّة بحصان عاهر بدلاً من الاهتمام بابني." هذا العالم المرعب الذي يحوّل البشر إلى آخرين، يبقيك يقظاً ومترقباً، لتراقب التفاصيل، وما هو مهم حقاً. الرواية من الأدب الأرجنتيني للكاتبة الشابة سامنتا شوابلين، وصلت إلى القائمة القصيرة لجائزة "MAN BOOKER"
Somehow I have already read two novels from Argentina and it's only the 41st day of the year. I kept seeing this one mentioned so I snagged it from the library. The entire novel is written in a conversation between a woman who is told she is on her death bed (it is unclear if this is true) and her friend's son, who appears to be on her bed, interviewing her about the worms. It is unclear to me what is actually going on. I don't mind some veils and smoke if it goes somewhere but this one really do Somehow I have already read two novels from Argentina and it's only the 41st day of the year. I kept seeing this one mentioned so I snagged it from the library. The entire novel is written in a conversation between a woman who is told she is on her death bed (it is unclear if this is true) and her friend's son, who appears to be on her bed, interviewing her about the worms. I was intrigued by many of the reviews I saw of this book after it was shortlisted for the Man Booker International prize, but I don't think I am the right person to review it. The whole thing reads like an extended nightmare, yet for me none of it was quite believable enough for it to affect me, and I suspect this is down to my psychological make-up rather than any fault of the writer or the translator, as dreams are very personal things. I received a copy of this book in exchange for an honest review. Thank you to the author, Samanta Schweblin , and the publisher, Riverhead Books, for this opportunity. The synopsis promised this to be "a nightmare come to life, a ghost story for the real world, a love story and a cautionary tale." It did not lie. This is the narrative between two individuals. One is recounting all that has led to her current prostrate predicament, as she lies in a hospital bed. The other is the child who sits besi I received a copy of this book in exchange for an honest review. Thank you to the author, Samanta Schweblin , and the publisher, Riverhead Books, for this opportunity. This book was, in a word... trippy. Despite the short size, and the quickness with which I read it, there was much to gather from this novel. And none of it made sense! I spent much of the first half of the novel at a total loss as to what was actually going on, and yet still, somehow, enjoying myself immensely. This book has an indescribable quality to it that was utterly mesmerising. It induced in me a drug-like stupor that accepted every inconceivable fact this put forward and denied it any contemplation over its inconsistencies or confusion it caused. A fast read, and while I read it, I did find it compelling, but the ending is totally dissatisfying and very odd. Maybe I missed something crucial, however I felt there was such a build-up and such tension, I was expecting some great revelation at the end. A talented writer (and translator), but perhaps better suited to the short story, or even poetry. Her language is moving and lyrical, but the story feels incomplete to me. Clear your diary before picking this one up. I defy anyone to lay it down once past the first five pages. And if you're like me, curious to understand precisely how the evil spell works, then the last page will be the signal to turn back and start again. It's because sooner or later something terrible will happen. My grandmother used to tell my mother that, all through her childhood, and my mother would tell me, throughout mine. And now I have to take care of Nina. But you always miss the impo Clear your diary before picking this one up. It was the rescue distance: it didn't work, I didn't see the danger. * 2.5 * - which is "it was ok" rather than "I liked it"
Not sure what to make of this book and that seems rather to be the point of it. I will acknowledge it does recreate the feeling of a fevered dream exceptionally well. I don't know if as a reader I particularly like being in this state, even for a book as short as this one. I am going to be obstinately old-fashioned and ruthlessly uncool by saying I find my books more satisfying if things are made slightly clearer. I was anticipating Fever D * 2.5 * - which is "it was ok" rather than "I liked it"
Not sure what to make of this book and that seems rather to be the point of it. I will acknowledge it does recreate the feeling of a fevered dream exceptionally well. I don't know if as a reader I particularly like being in this state, even for a book as short as this one. I am going to be obstinately old-fashioned and ruthlessly uncool by saying I find my books more satisfying if things are made slightly clearer. I was anticipating Fever Dream not to make complete sense, but with the trade-off that I would be blown away by the writing or some stunning philosophical insight or find a character that really stands out. Here I feel I got a kind of atomiser spray of environmental weirdness that evaporated at the end and left me a little slumped. I reacted exactly the same way to Jeff Vandermeer's Annihilation and John Darnielle's Universal Harvester . In every case like this my reading experience goes the same way. I embrace the book to begin with, respect the author for creating this fog of subtle horror and get excited at the possibilities of where this could be heading. Then with a dawning dread I watch the pages dwindle and find myself fretting about the work that needs to be done in interpreting all this weirdness and anticipate the inevitable petering out of the story. Ameri Dream is the right word for what we think we observe in this novel. Something poisonous is going on involving two mothers, their children, and pollutants that have entered the soil and water in a countryside that should nourish farmers, ranchers, and vacationers. The cycle of life has been profoundly disrupted and neither residents nor visitors can or will speak of the horror in the vacation wonderland. It looks as though some kind of paranormal witchery is being considered a kind of cure. En una entrevista sobre los cuentos de Pájaros en la boca, Schweblin dijo: Lo que creo es que si bien la literatura que intento hacer se acerca por momentos al fantástico, para mí el verosímil es fundamental. Me importa mucho partir de una historia casi totalmente realista, pero que lo que suceda en el medio pueda ser un poco sobrenatural. La idea es que eso se produzca por un corrimiento muy pequeño de la realidad, como un detalle. El resultado es monstruoso, pero en realidad la anomalía es mín En una entrevista sobre los cuentos de Pájaros en la boca, Schweblin dijo: Lo que creo es que si bien la literatura que intento hacer se acerca por momentos al fantástico, para mí el verosímil es fundamental. Me importa mucho partir de una historia casi totalmente realista, pero que lo que suceda en el medio pueda ser un poco sobrenatural. La idea es que eso se produzca por un corrimiento muy pequeño de la realidad, como un detalle. El resultado es monstruoso, pero en realidad la anomalía es mínima. Si bien me interesan los mundos fantásticos, lo que me preocupa no es el mundo fantástico en sí, no la historia de Frankenstein, sino la inserción de un pequeño detalle fantástico en una historia realista. En cuanto el verosímil no funciona, queda algo lúdico en los cuentos que no me convence, por eso me cuido mucho de no pasar ese límite. Prefiero estar siempre parada en la vereda de lo real mirando hacia el mundo que uno no conoce, hacia la oscuridad. Bien podría estar hablando sobre Distancia de rescate. Al comenzar esta historia es mejor saber poco sobre lo que nos vamos a encontrar. Ir casi a ciegas, encajando poco a poco las piezas del rompecabezas, intentando separar la locura de la cordura, o incluso el sueño de la vigilia. No será del todo posible. Dejando de lado las distintas temáticas que toca, esta lectura ha sido sobre todo una experiencia, una claustrofóbica, adictiva, opresiva y terrorífica. Se lee en tensión, con inquietud y algo de ansiedad, esperando que la narradora, guiada por una voz que la incita a apurar, consiga darse cuenta de lo importante, llegue al punto exacto, a una explicación. The harmful effects of pesticides – a theme that might not be obvious to an urban reader of the book (the characters themselves seemed to not know about them) is the unnamed curse of the town. However, as with the treatment of psychopath theme in ‘Room’, the much louder theme just serves as a background for theme of how strong a mother’s love is. You know how homo-sapiens, especially females, keep on sentimentalizing over their parental investment and all that. Now comes the best part though – an The harmful effects of pesticides – a theme that might not be obvious to an urban reader of the book (the characters themselves seemed to not know about them) is the unnamed curse of the town. However, as with the treatment of psychopath theme in ‘Room’, the much louder theme just serves as a background for theme of how strong a mother’s love is. You know how homo-sapiens, especially females, keep on sentimentalizing over their parental investment and all that. Now comes the best part though – and it is the fact that the things occur, or rather are being remembered as if they occur in dream – Nah, a nightmare. For the most part, it makes most logical sense – Amanda, the protagonist, is dreaming while lying on her death bed (hence the title) - there are some things towards the end that Amanda couldn’t have known but then she might still be dreaming – the whole unreliable narrator thing. It is how brilliantly this dream reality has been created which gets the book 5 stars. Nabokov describes the way we perceive reality as something subjective – and authors are not supposed to imitate the common perception of reality but make you see the others’ perception of reality. And so it is not Schweblin is asking you to believe in stuff but just to believe that Amanda and Clara is perceiving things that way. Clara believes in superstitious soul thing when her son’s life is in danger, not because she doesn’t know better, but because she chose to believe in a version of the world where her only child will survive – the alternative would have been too unbearable. And anyway she doesn’t know about pesticides and with all the deaths in the city, the God’s balance of life or Science’s chain of cause and effect would have stopped making sense to her. The same maternal instinct shows in Amanda with her ‘rescue distance’ thing. Think of the way we dream. Our brain is processing things slow and through alternative mediums of dreams – sometimes fragments of memory aren’t as readily available as when we are awake. It might take a few moments to remember them or we might not until we are awake – that is how we sometimes talk with our deceased dear ones in dreams without remembering they are dead. Even where we are remembering, a shocking information will shock us as much as when we first come across them – thus making it more like reliving rather than just plain remembrance. Amanda is unable to remember what David did to horses before reaching the point in her reliving when Clara had told her. From the bed in a clinic where she lies dying, Amanda rests beside a boy who is not hers and pushes her to tell a story. In an effort to piece together the events that led to her illness, Amanda reaches into her memory and tells the boy her recollections of a day she spent with his mother. In a nod to its perfectly apt title, I devoured Fever Dream in a delirious few hours and turned it over to start again when I was finished. At just 192 pages, Samanta Schweblin’s newly translated debut reads li From the bed in a clinic where she lies dying, Amanda rests beside a boy who is not hers and pushes her to tell a story. In an effort to piece together the events that led to her illness, Amanda reaches into her memory and tells the boy her recollections of a day she spent with his mother. In a nod to its perfectly apt title, I devoured Fever Dream in a delirious few hours and turned it over to start again when I was finished. At just 192 pages, Samanta Schweblin’s newly translated debut reads like a single breath, leaving no room to stop turning the pages. Though the structure of the narrative is tricky to parse out at first, with the characters’ narration noted in different fonts, once it becomes clear who is speaking the story takes off and refuses to let go. It is dreamlike and odd and absolutely cloaked in a sense of dread. While Amanda tells the boy, David, the story of his mother, he pressures her to reach the points he hopes to hear with relentless prodding. It gives the novel a deeper sense of urgency, while also adding to its increasingly weird mood. What is important? Why is Amanda wasting time? What’s with the worms? HURRY UP. I would read nothing but suspense novels if this surreal trip was the kind of suspense regularly being published. While it’s certainly not for everyone, readers who love the chaotic feeling of not knowing (think The Beautiful Bureaucrat), even in the end, need to run and grab a copy of Fever Dream as soon as possible. This book is unlike any other I've read, and I'm not talking like AN UNEXPECTED PLOT TWIST with totally predictable structure. Nah. This is weeeeeirdy weirdo, but so damn cool. I feel like every time I re read this, I'll have a totally different experience and perception. I don't think I can give it 5 stars because I'm not quite sure I figured out the author's intention with a good deal of the symbolism but lordy that was great. Fans of Jesse Ball and Helen Phillips won't want to miss this latest piece of surreal literature that blends such themes as eco-horror and the bizarre terror of motherhood. Be warned, though: only read this if you're okay with not knowing what the hell you just read. If you do choose to read this, I recommend setting aside a couple hours to knock it out in one sitting as I did early this morning. It's short and quick enough that that's not an unreasonable suggestion. Let yourself get lost in it a Fans of Jesse Ball and Helen Phillips won't want to miss this latest piece of surreal literature that blends such themes as eco-horror and the bizarre terror of motherhood. Be warned, though: only read this if you're okay with not knowing what the hell you just read. If you do choose to read this, I recommend setting aside a couple hours to knock it out in one sitting as I did early this morning. It's short and quick enough that that's not an unreasonable suggestion. Let yourself get lost in it as if you're part of the hallucinatory fever dream. The young woman whose fever dream we experience is called Amanda. She lies dying of poison in a rural hospital, accompanied by a strange boy named David. Her daughter, Nina, is nowhere to be found. The book consists of a conversation between Amanda and David, with David trying to coax her into recalling what happened to her and how she got here. There's a palpable feeling of dread and menace that lurks throughout this story. It reminds me of Jesse Ball in the way that it coaxes us, the reader, through, feeding our fascination with the unknown and our desire for answers. Is it horror? Sort of. It's certainly very creepy in a Lynchean way. I'm still not sure what I read, and if this book had required a bigger investment of my time I might find that obscurity frustrating--unlike Ball and Phillips, who are ultimately willing to be more forthcoming with the reader, Schweblin remains more elusive. No sé bien qué decir en estos momentos. Es una historia asfixiante, que no solo me inquietó a lo largo de su lectura, sino que aún mis pensamientos se están haciendo un festín en mi cerebro con las dudas que se encuentran por el camino. If you like to read a short novel and think "wtf did I just read?" this is a great one to pick up. I let myself sit on this for a few days before reviewing and I haven't been able to make any more sense of it. I went into Fever Dream only really knowing it was a horror. That was the wrong reason to pick it up because I didn't get strong horror vibes. The story didn't scare me at all. What is scary is the (view spoiler)[toxic poisons in the environment and the idea of not being able to protect y If you like to read a short novel and think "wtf did I just read?" this is a great one to pick up. I let myself sit on this for a few days before reviewing and I haven't been able to make any more sense of it. I went into Fever Dream only really knowing it was a horror. That was the wrong reason to pick it up because I didn't get strong horror vibes. The story didn't scare me at all. What is scary is the (view spoiler)[toxic poisons in the environment and the idea of not being able to protect your child (hide spoiler)]. Of course, is that the message of the story? I couldn't tell you. The first part I think yes, the second part I gained on my own through the constant bringing up of rescue distance between mother and child. In reality, this story is a woman dying in a hospital bed with a young boy who is not her son by her side. He wants her to remember how she got there. My mother always said something bad would happen. My mother was sure that sooner or later something bad would happen and now I can see it with total clarity, I can feel it coming toward us like a tangible fate, irreversible. Now there’s almost no rescue distance, the rope is so short that I can barely move in the room.